WASHINGTON—The federal budget process is broken and needs drastic repair, according to lawmakers. In recent years, the budget has become a tactical game for political parties, leading to delays, uncertainties, and government shutdowns. 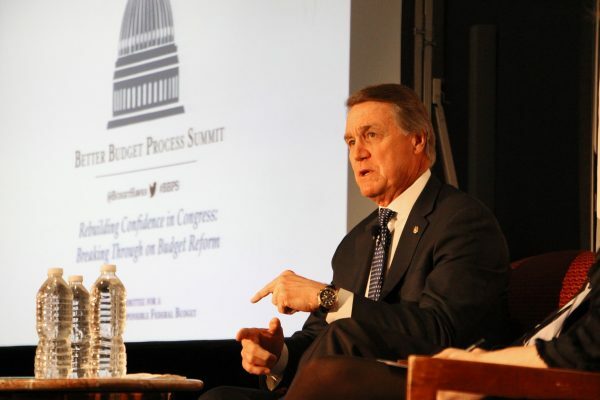 Sen. David Perdue (R-Ga.), a member of the Budget Committee vented his frustration about the committee and the budget process at a panel discussion on Feb. 26. “I fought hard to get on the Budget Committee, coming from the business world, thinking ‘well this is where the action is.’ It’s a joke,” Perdue said. “I would blow the Budget Committee up unless we change some of these rules, seriously. It does nothing,” he complained. Perdue was a Fortune 500 CEO and had over 40 years of business experience prior to his election to the U.S. Senate in 2014. He was the former CEO of Reebok athletic brand and Dollar General stores. Perdue gained a reputation on Wall Street as a turnaround CEO who helped revive brands, reduce corporate debt, and increase shareholder value. Now, in the Senate, he’s trying to fix Washington’s budget and debt problem. I would blow the Budget Committee up unless we change some of these rules, seriously. It does nothing. The national debt is $20 trillion, and this is short-term debt—it has an average duration of less than three years. The national debt is headed to $30 trillion in the next 10 years due to the failed budget system, warned Perdue. “You’re not going to solve the debt crisis by fixing the budget process alone, but you will not solve it unless and until you do start fixing the budget process,” he said. Congress has often failed to follow the rules and timetables in the 1974 Budget Act, moving from one crisis to another. It has funded the government on time only four times in the last 44 years. And it has shut the government down 20 times during the same period. The majority party can cram down the throat of the minority its version of the budget, which is the budget resolution, said Perdue. After the budget is passed, the spending it must be authorized in separate bills. And in the authorization process, “the minority party says ‘well you didn’t ask our opinion in the budget process so we won’t help you in the authorization process’ and nothing ever gets to 60 votes,” explained Perdue. “We’ve got $315 billion expenditures today that are not authorized. The State Department until two years ago had not been authorized in 15 years,” he complained. Many lawmakers share Perdue’s enthusiasm for reforming the federal funding system. “There’s a very strong bipartisan feeling on the floor that this is just a completely negative, unhelpful, divisive, useless process,” he said at the panel discussion. Both Whitehouse and Perdue will serve on the new Joint Select Committee on Budget and Appropriations Process Reform, a 16-member, bipartisan, bicameral panel tasked with fixing Washington’s broken funding system. The committee will propose legislation to improve the process later this year. President Donald Trump signed the Bipartisan Budget Act of 2018 into law, ending a brief overnight government shutdown on Feb. 9. The bill raised the funding caps by nearly $300 billion in the next two years and increased the debt ceiling. It is the second-largest spending increase in a decade. And the annual deficit is now projected to reach over $1 trillion next year, a deep concern for fiscal hawks. For the 2018 budget, Congress still has to appropriate money for each program for the remainder of the fiscal year. So it needs to pass an omnibus spending bill with full appropriations before the next stopgap measure expires on Mar. 23. Every year, Congress must pass bills that appropriate money for all discretionary government spending, which the Budget Act requires be done in 12 appropriations bills. Of the 12 appropriations bills, Congress has only averaged two and a half bills each year over the last 44 years, Perdue said. When Congress cannot produce separate bills in a timely fashion, it rolls the appropriations bills into one omnibus spending bill. “After over 180 continuing resolutions in the last 44 years, we end up with an omnibus where a group of people get in a room and decide how to spend a trillion dollars. It’s not acceptable anymore,” Perdue said. According to both senators, the current debt ceiling is not effective either. They propose a bill that sets a long-term target for debt as a percentage of gross domestic product (GDP). Federal debt relative to GDP has grown dramatically and is now higher than at any other time in history outside of World War II, according to the Committee for Responsible Budget (CFRB), a non-partisan organization. Debt and deficit will be much worse if the unsustainable fiscal situation continues, and the country will face a $2.4 trillion deficit and a debt of 113 percent of GDP by 2028, stated a CFRB report. The U.S. federal budget is not done in a long-term, thoughtful manner, according to Maya MacGuineas, president of the CFRB. 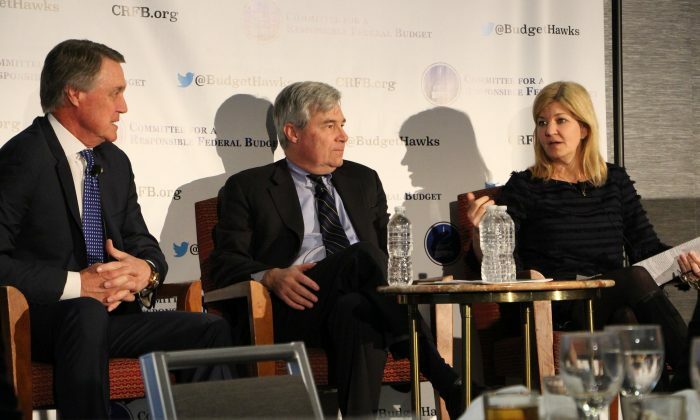 CFRB recently hosted the first annual “Better Budget Process Summit,” bringing together policy experts to set in motion ideas to create an efficient and transparent budget process. According to MacGuineas, the timing is perfect and the Trump administration is supportive of the efforts to fix the broken budget process. This administration is “trying to work with Congress,” she told the Epoch Times. “They’ve seen how many things get held up and they were supportive of the idea of including a Joint Committee [in the bill],” MacGuineas said.